Alex Ching needed an extra hole to defeat T.J. Kua, sinking a 20-foot birdie putt for the win. Alex Ching and Jonathan Ota will try to use experience to their advantage when they meet for the 100th Manoa Cup championship today. Ota - a veteran of the tournament - won the 2006 title, reached the quarterfinals last year and earned a shot at a second championship yesterday. Ching, though just 18, has been playing the Oahu Country Club layout for the last 10 years as a member of the club, using his course knowledge to reach the 36-hole final. "Jonathan's such a good player and has so much experience under his belt and I think (today's) just going to be a fun experience," Ching said. "I'm just going to take everything I've been doing in my last 10 years here and see how it goes." Jonathan Ota won the Manoa Cup two years ago and will get the opportunity to play for the title again today. Ching played a remarkable 43 holes yesterday to win dramatic quarterfinal and semifinal matches. He outlasted Travis Toyama in 24 holes and needed 19 more to defeat T.J. Kua in the semis, dropping a 20-foot birdie putt on the playoff hole in the win. Ota, 46, defeated Michael Park 5 and 3 in the morning round and got past Wade Nakamura 4 and 2 in the afternoon to return to the final. Nakamura knocked defending champion Kurt Nino out of the tournament in the quarterfinals with a 3-and-2 win. Kua birdied No. 18 to edge Brandan Kop 1-up in his quarterfinal match. Today's final starts at 7 a.m. at OCC. Friends Alex Ching and T.J. Kua shared a laugh as they walked up the 7th green yesterday. Ching eliminated Kua in 19 holes in a semifinal of the Manoa Cup. Alex Ching played only 10 holes to win his third-round match at the Manoa Cup on Thursday. He more than made up for it yesterday. It took the recent Punahou graduate 43 holes played over close to nine hours to win his quarterfinal and semifinal matches to advance to today's championship match with Jonathan Ota. "Never in my life," Ching said when asked if he'd played that many holes in a single day, "and hopefully not again." Both Ching and Ota were ready to get off of their feet after making two tours of Oahu Country Club yesterday and will be back at the first tee at 7 this morning for the 36-hole final in hopes of becoming the 100th winner of the state's oldest golf tournament. Ching, who won his third-round match 9 and 8, went 24 holes to outlast two-time champion Travis Toyama in yesterday morning's quarterfinal match. He then needed another 19 to fend off close friend T.J. Kua, dropping a 20-foot birdie putt on the first playoff hole. "Either way I would have been happy," said Ching, who is hosting Kua, a Kauai resident, at his home this week. "Tomorrow I could have been here watching him in the finals. So it would have been good no matter what the outcome was." Ota had a slightly shorter day, defeating Michael Park 5 and 3 in the quarterfinals and Wade Nakamura - who eliminated defending champion Kurt Nino earlier in the morning - 4 and 2 in the semis to return to the final. "I just have to go out and play the way I've been playing this whole week, and if it's good enough, it is," said Ota, the 2006 Manoa Cup champion. "If I start changing and trying to swing hard and chase him, I'll probably be out. I just want to stick to how I've been playing." Ching breezed through the tournament's early rounds, not going past the 14th hole in his any of his first three matches. But he showed an ability to play from behind as well in rallying to tie Toyama with birdies on the last two holes of regulation then surviving the sudden-death playoff. Ching and Toyama matched each other over the next five holes of sudden death before Toyama put his drive on No. 6 behind a tree. Toyama had to chip out onto the fairway and with Ching facing a short birdie putt, he conceded the match when his par putt slid by the cup. "That was the goal, to make pars and if he makes birdies he deserves it," said Toyama, who is considering turning pro before next year's Manoa Cup. "I didn't want to just give it to him, make him earn it, and he did. "I was telling my caddy I hadn't been this nervous in a while, knowing that one bad shot you lose, one good shot you win." Ching had barely enough time to take a quick shower, change and scarf down a sandwich before having to get to the tee for his match with Kua. The duo, often joking with each other on the tee box and the greens, matched each other through seven before Ching chipped in for birdie on No. 8. His lead grew to 3-up after 13 holes, but Kua battled back to square the match with a par on No. 17 and both bogeyed the 18th to force another playoff. "We've been in duels before, the ILH championship was one of them this year, but we always have fun together," said Kua, who recently graduated from Kamehameha. Playing No. 1 for the fourth time, Ching put his approach to within 20 feet. Kua pulled his drive into the fairway of the second hole, but made a remarkable recovery in sticking his second shot within 5 feet of the cup. Ching answered by rolling in the long birdie putt while Kua's attempt stayed to the right of the hole to end the match. 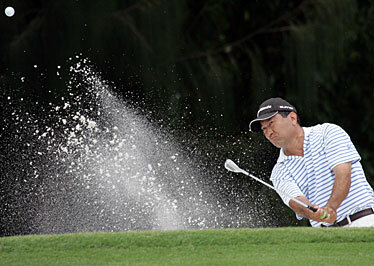 "I played this hole four times and each time I'd been in the same place," Ching said. "I thought hopefully some time I'd make it." "That was a blow," Kua said. "But I expect him to make every putt on this golf course and expect him to make every shot." Kua reached the semifinals by edging four-time champion Brandan Kop 1-up in the morning. He tied the match on No. 17, then stuck his approach to the 18th green to within 6 feet and made the birdie putt to win. Nakamura's putting led him to a 3-and-2 win over Nino, advancing to the semifinals for the first time. He took a 2-up lead on Ota after seven holes, only to see Ota win the next four to turn the match around. "The fatigue gets to you," said Nakamura, who last played in the tournament in 2002. "You don't feel it in the morning and then you get to the afternoon. After front nine, the mind says, 'go' but the legs aren't moving already ... but this was a good run."